The Lord of the Rings movies were, like the books, released as three separate entities between 2001 & 2003. They were released by New Line Cinema under the direction of Peter Jackson. The Fellowship of the Ring – Released on December 19th, 2001. The title is often shortened to FotR. The Two Towers – Released December 18th, 2002. Title often shortened to TT. The Return of the King – Released December 17th, 2003. Title often shortened to RotK. that were released with the Special Extended Edition of each film. 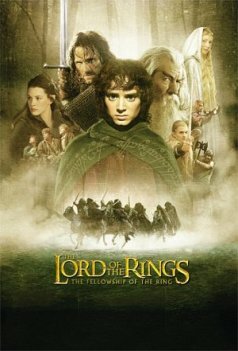 Check out our great selection of Lord of th Rings movie posters. Parts of The Lord of the Rings had been adapted to film before, once by Ralph Bakshi in 1978 and again by Rankin-Bass (who also did a version of The Hobbit) in 1980. Both of these films were animated, and though Bakshi’s version received some critical acclaim neither film satisfied fans of the books. In 1995, Director Peter Jackson began to visualize something far more ambitious for The Lord of the Rings movies…a full cinematic treatment of the books using real-life actors and settings. Jackson began negotiating with copyright holder Saul Zaentz and Miramax Studios and by the beginning of 1997 they had reached an agreement for a two film treatment of the novels. Jackson and his wife, Fran Walsh, began writing the screenplay for the Lord of the Rings movies around this time and were soon joined by fellow screenwriter Philippa Boyens. The original screenplay, written to break the three-book storyline into two parts, followed a similar tack to that which Bakshi had taken with his Lord of the Rings adaptation, finishing the first film with “The Battle of Helm’s Deep”, a scene which eventually became the climax of the second installment, The Two Towers. By early 1998, however, Miramax had begun to express grave concerns about the film’s budget and asked that the screenplays be condensed into a single film. Jackson refused. In August 1998 the entire project was sold off to New Line Cinemas. New Line Cinemas’ co-CEO Robert Shaye, far from wanting to condense the screenplays, wanted to expand The Lord of the Rings movies to three full films, and provided the necessary ($270 million) budget to do so. Though the three-movie treatment allowed far more creative and financial freedom, it still required that scenes from the books be trimmed or rearranged, either to fit within an allotted time frame of avoid unnecessary confusion. Some popular scenes from the books – most notably the Old Forest, Tom Bombadil, the Barrow Wights, and “The Scouring of the Shire”, were cut from the scripts altogether. Other characters roles were subtly rearranged or expanded to further streamline the script. Altogether, however, Jackson was universally praised by critics and Tolkien fans alike for his generally true-to-the-text treatment of the Lord of the Rings movies. Jackson had begun the preparations for production during 1997, while the film was still with Miramax, and merely had to begin expanding the scope of the project after its acquisition by New Line Cinemas. He had already storyboarded many of the movies’ scenes and begun collaborating with longtime friend Richard Taylor at WETA Workshop to create the details of Middle Earth – makeup, wardrobes, armor, weaponry, and setting minatures. By the end of 1997, renowned Tolkien artist Alan Lee and John Howe had also joined the project to assist with the very complex creation of imagery, settings, and architecture from the books. Filming for all three films began in October 1999 in New Zealand and was fairly complete just a year later in December 2000. Production was fairly complex, due to the differing sizes of the characters. Hobbits (and Dwarves) are no more than four feet in height in Tolkien’s novels, while the real-world actors portraying these characters are of average size. This problem necessitated extensive use of forced perspective, where differently scaled objects and different vantage points of the camera make certain characters appear larger or smaller. Jackson took this one step further than had been done previously by allowing this idea to be employed even during moving shots. The movies also employed novel ideas in computer animation. Actor Andy Serkis acted out the role of Gollum in a “motion capture” suit, then the character of Gollum was digitally animated over top of Serkis’s body. Many other characters – including the spider Shelob, the Trolls, and Treebeard and the Ents – were created entirely using CGI animation. The musical score was composed by Howard Shore, who was hired into the project in 2000. The bulk of the score is performed by the London Philharmonic Orchestra, with guest appearances by performers as diverse as Enya and Billy Boyd. All in all, the Lord of the Rings movies eclipsed even the most optimistic predictions. The three movies combined for 16 Academy Awards, including “Best Picture” for The Return of the King. For the sake of organization and bulk, I’ve created a separate page for each of the three films. Click on the links below to be taken to the specific pages for each of the Lord of the Rings movies.